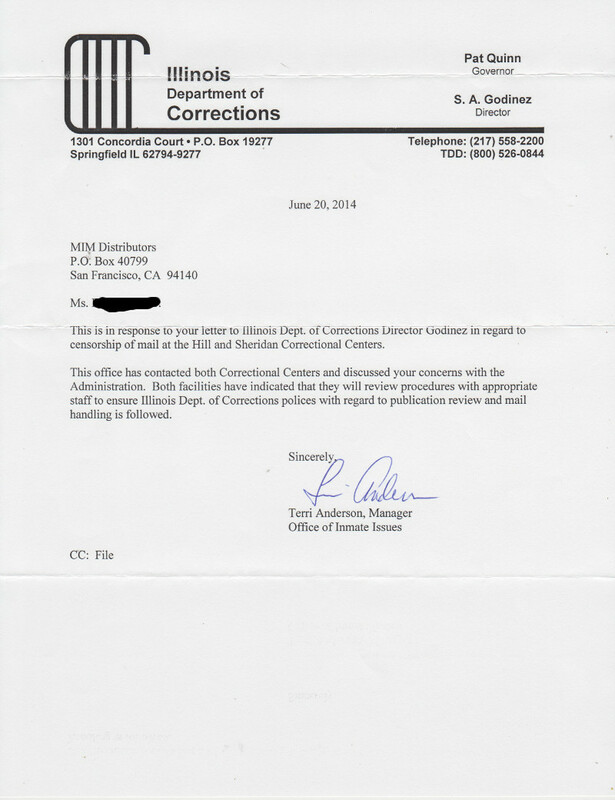 This letter is regarding the illegal censorship if mail at Hill Correctional Center and Sheridan Correctional Center. Enclosed are letters I have sent to the Wardens and Publication Review Committee at these respective facilities. We have not received responses from administrators at the facilities themselves, and hope that your office can help end their illegal practice of censoring mail without cause or process. This letter is regarding the illegal censorship if mail to Mr. x, a prisoner housed at Hill Correctional Center. On February 16, 2014, MIM Distributors mailed Mr x an envelope via Media Mail with the USPS. This envelope contained at least one spiral-bound book, among others. The envelope was returned, unopened, to MIM Distributors with "Spiral bound book" written on the outside. We were not sent a Publication Receipt and Course of Action Form DOC0211 regarding this incident. In Title 20: Corrections, Criminal Justice, and Law Enforcement, Chapter I: Department of Corrections, Subchapter e: Operations, Part 525 Rights and Privileges, there is no mention made of spiral bound books and whether they shall be permitted or censored. 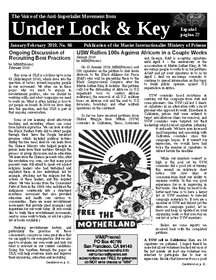 The instructions that are provided in Title 20 for handling of this material are in direct conflict with the actions of the Mailroom staff at Hill Correctional Center. Please provide us with a copy of the administrative code that dictates spiral bound books should be disallowed at Hill Correctional Center. We would appreciate if you took any necessary, appropriate and advisable measure (such as internal investigations, proper employees? training and similar) to stop this illegal ban on all mail coming from MIM Distributors, and start determining the allowance of mail based on Illinois Department of Corrections policy, not superfluous, illegal restrictions. On 4 November 2014 MIM Distributors sent a priority mail package to Mr. XXXXXX XXXXXX with USPS Signature Confirmation. This is normal practice when mail has gone missing without explanation from the facility. The mailroom staff at CSATF used the USPS Signature Confirmation to justify the censorship of MIM Distributor's mail stating, ?REFUSED: Inmate Unable to Sign for Mail at Post Office.? It is not USPS policy that the recipient of the mail must be the person that the mail is addressed to. In the case of PO Boxes, which CSATF mail is sent through, anyone with access to the box is considered an authorized agent who can sign for the mail. Yet, the label on the mail returned to MIM Distributors seems to indicate that it is regular practice of CSATF to not sign for mail. My question for you is whether it is CSATF's policy to refuse any mail with signature confirmation? If so, what is the best method to ensure delivery to prisoners held at CSATF when mail goes missing without notice from your staff? If not, can you assure me that this will be addressed with mailroom staff so that future Signature Confirmation mail is delivered as it should be? In mid-November I wrote you regarding the refusal of mail from MIM distributors to someone being held prisoner at your facility. 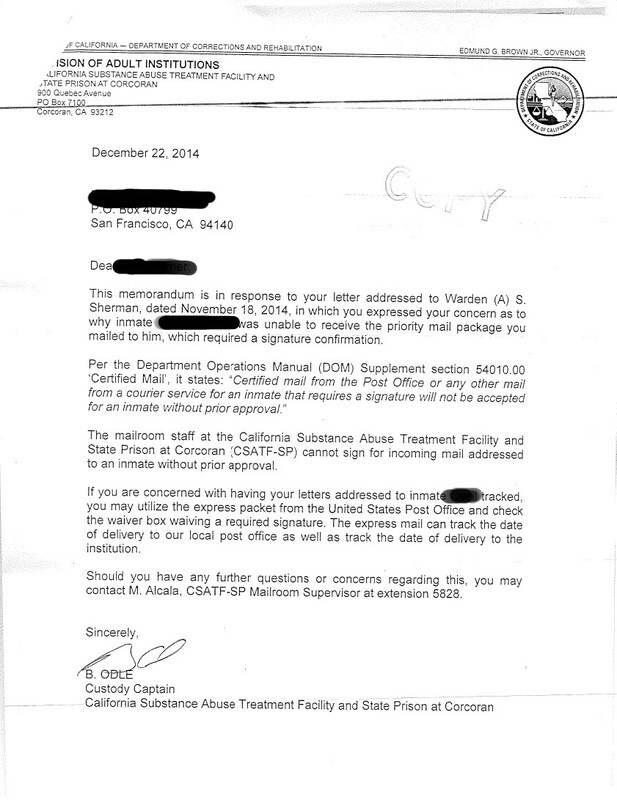 The mail was rejected for the reason, ?REFUSED: Inmate Unable to Sign for Mail at Post Office.? I have not received a response to my inquiry and am unsure how to have MIM Distributors proceed in ensuring that their mail is delivered moving forward. To reiterate, the questions that I had posed to you were: whether it is CSATF's policy to refuse any mail with signature confirmation? If so, what is the best method to ensure delivery to prisoners held at CSATF when mail goes missing without notice from your staff? If not, can you assure me that this will be addressed with mailroom staff so that future Signature Confirmation mail is delivered as it should be?